June | 2008 | Let Teddy Win! Teddy Roosevelt had never won a race at Nationals Park (at least not without being disqualified for cheating); but tonight a packed house got to cheer as our beloved #26 came from behind and crossed the finish line to claim victory in a 1-on-1 grudge match vs. The Bird from Baltimore. It was a night of firsts, starting with the first Washington Nationals home game since July of 2006 not to feature an official presidents race. The “unsanctioned” event was announced only yesterday, after Teddy was tripped by the Orioles mascot, robbing him of a presidents race victory. With the outfield scoreboard displaying the two contestants’ vital statistics (Moustache-span: 2.5 ft), the racers were introduced and Teddy appeared from the centerfield gate draped in an American flag. The Bird got a huge jump out of the gate, but Teddy quickly turned on the afterburners. As they raced past the centerfield wall flashing “TED-DY,” Teddy passed The Bird to run away with it in the home stretch. It was the unquestioned highlight for Nationals fans in an otherwise depressing 9-1 loss to the Orioles. No, this one doesn’t count in the standings (if there was any doubt, it was removed when the “The Presidents Racing Association of America” announced the fact shortly after the race), but one can hope that Teddy’s come-from-behind victory will serve as momentum and inspiration. I’m sick about Teddy and I need your help! 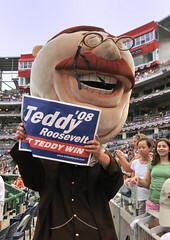 Nationals Park will be rockin’ with Teddy Roosevelt supporters tonight, which is why I am beside myself that I can’t be there. I’ve been sick at home, hoping to recover, but it’s clearly not happening. Tonight is the grudge match — an “unsanctioned” race between Teddy Roosevelt and Baltimore’s Bird in the middle of the 4th inning of tonight’s “Battle of the Beltways” at Nationals Park. 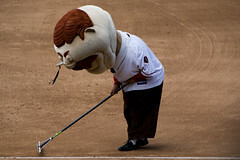 The challenge was issued by Teddy after The Bird tripped him in the home stretch of last night’s presidents race. I really have a feeling that Teddy’s going to win this thing, and I want to be there to witness him cross the finish line a legitimate winner. The game should be a sellout. Imagine 42,000 fans cheering Teddy across the finish line and putting the Baltimore Oriole to shame. There are so many questions. Will there be an actual presidents race, or will there only be this “unsanctioned” showdown? What tricks does Teddy have up his sleeve for The Bird? Will Teddy win? If he doesn’t, will the fans ever let That Bird back into Nationals Park? Sadly, I have to watch from home. 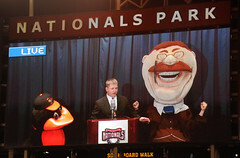 I’m counting on all of you to cheer for Teddy, and to be the eyes and ears of the presidents race blog. Wear your Teddy t-shirts and wave your Teddy signs. Bring your cameras and camcorders and share the results tonight. Most of all, have fun! Go Nats! Go Teddy! 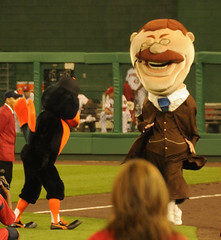 After tripping incident, Nationals’ Teddy Roosevelt challenges The Bird to “unsanctioned race” on Saturday. The over 35,000 fans who packed Nationals Park for the opening game of the “Battle of the Beltways” series between the Washington Nationals and the Baltimore Orioles were treated to a spectacle of presidential proportions on Friday night. presidents race kicked off, as Teddy Roosevelt took a commanding lead out of the gate and drew cheers as he rounded the warning track in right field. Even the Baltimore Oriole mascot jumped onto the field to cheer for Teddy as he approached the finish line. Or so it seemed. As Teddy Roosevelt neared the finish, The Bird stuck out a claw and tripped him, sending him reeling onto the dirt, as George Washington and the other racing presidents flew by. George took the victory and a bow as Teddy and The Bird scuffled along the baseline. 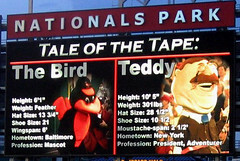 One inning later, a “press conference” was shown on the outfield high-definition scoreboard, announcing a grudge match between Teddy and The Bird. 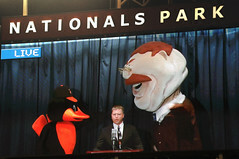 Teddy challenged The Bird to an “unsanctioned race” to be held during the 4th inning of Saturday night’s game between the Orioles and Nationals. This unsanctioned event was then promoted repeatedly throughout the evening. It makes one wonder what surprises are in store for Saturday night. The Washington Nationals are clearly pulling all the stops to make this a big weekend. 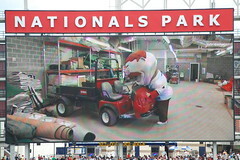 In addition to the special presidents race between Teddy and The Bird (which the announcer described “the race of the century”) on Saturday night the Nationals are kicking off Nationals Park Saturday Night Movies. On select Saturday nights throughout the season, the Nationals will play a feature film after the game on the high-definition scoreboard. Concessions and parking will remain open during the movie, and fans are encouraged to move to any open seat on the 3rd base side of Nationals Park (presidential seats excepted). But the big attraction is clearly the race itself. Let’s all show up on Saturday night prepared to root for Teddy Roosevelt as he takes on The Bird in this “unsanctioned” event. It’s sure to be a really good show. Now those of you who go to the Washington Nationals games at Nationals Park don’t have to rely on our standings page to track presidents race results. On Wednesday night, for the first time since the Nationals moved to their new stadium, the presidents race standings were featured on the on the centerfield wall scoreboard. For some reason, it took the Nationals a full half of the home season to bring back this tradition which we’d come to expect at RFK Stadium. Better yet, the Nationals have begun showing the current standings during the presidents race. It looks awfully cool as the presidents race by the 14-foot high out-of-town scoreboard wall. I’m sure the team figured that if you were looking for score updates from around the league during the presidents race, then you had to be a loser anyway. It’s a sad state of affairs when our beloved Mount Rushmore racing presidents have to resort to violence to make the news. From flickr member bullneck comes this disturbing photo of Tuesday night’s presidents race, in which Abe and Teddy used a trip wire to take down Thomas Jefferson and George Washington. The composition was featured as the DCist photo of the day. Mercifully, the violence took the night off last night as Teddy Roosevelt grabbed a big lead on his own in the 4th inning presidents race. Unfortunately, a penguin (or more precisely, somebody in a rally penguin costume) caught his eye along the right field line, and Teddy followed it into the stands, giving Abe Lincoln the window he needed to steal the victory once again. Of Note: At the half-way mark of the first home season at Nationals Park, Abe Lincoln has matched his entire win total of last year, taking 22 of the first 41 presidents races and showing no signs of slowing down.